If you want to get better results, you have to change something! 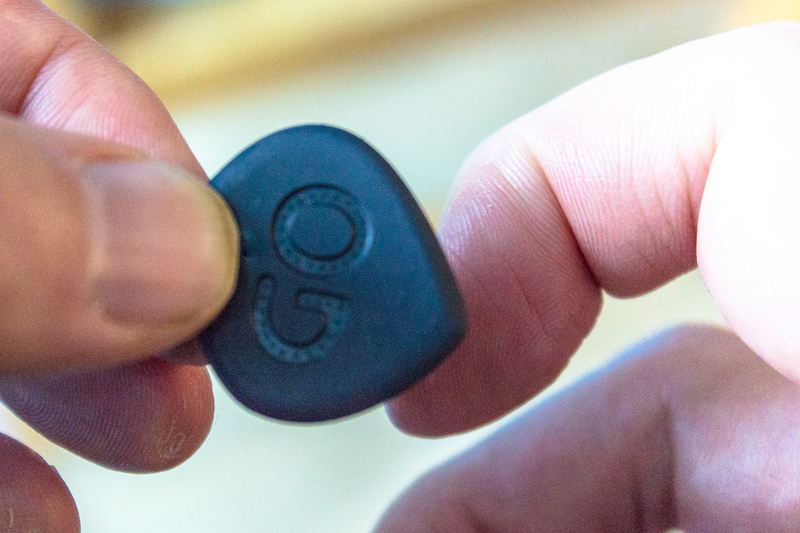 The GO is a hard and totaly unflexible Pick, designed to play fast. 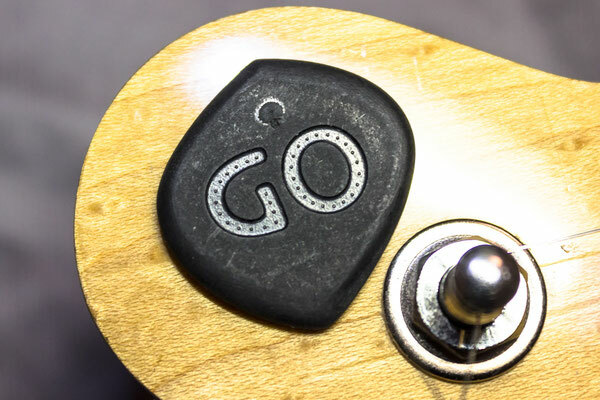 The tips, especially the wide angled tip above of the "GO" sign, is designed so that the strings glide under the Pick, when you turning it a littlebit. It is also a Pick that is designed to hold it in the "right way" (see the Pictures), and with the "right way" i mean the way that is described in most of the "How to hold a Pick" Guides you found in the Internet. People who have a very indivudual art of holding a pick, and i saw a lot, will perhaps need something different. But again: The GO is not (!) 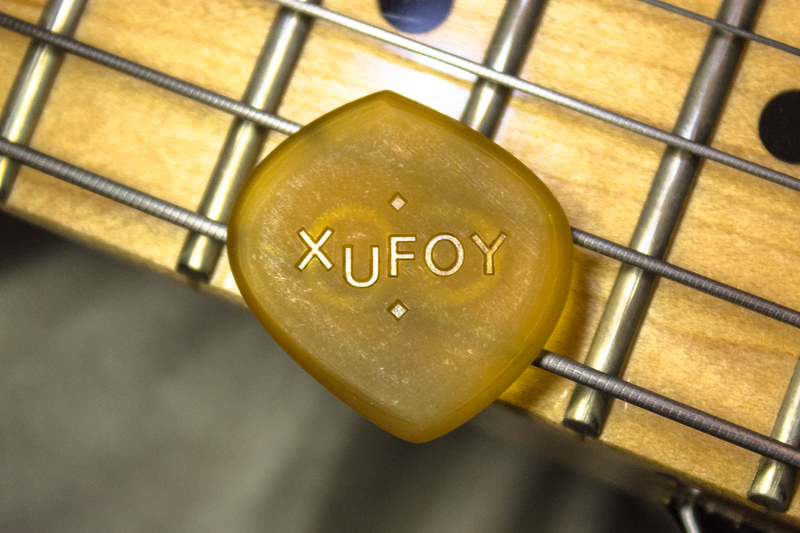 designed to be a very "special" or extraordinary Guitar Pick. It is designed to be a very normal Pick, which can be easy hold in the right way and enables the Player to play unlimited Fast. But here begins the problem, or the challenges: Because many (amateur) guitarist think that a "good" Plectrum is hard to play. And many (amateur) guitarists have used many years plectrums that does not suite what they want to play. Another "problem" is: Other people tend to say "Oh, i dont need a ne plectrum to playing better or faster, its all about technique!" What they mean is: "I dont need a good Plectrum, its all about technique!" So, when you say it like this, you recognize soon, that that is nonsense. Or did you ever heard of a famous guitarist who is saying "Oh, i dont need a good guitar to make recordings in the studio, i use my little cheap plastic guitar, that i found in a toy store. It stays not in tune and has a bad sound, but hey, its all about technique!"? 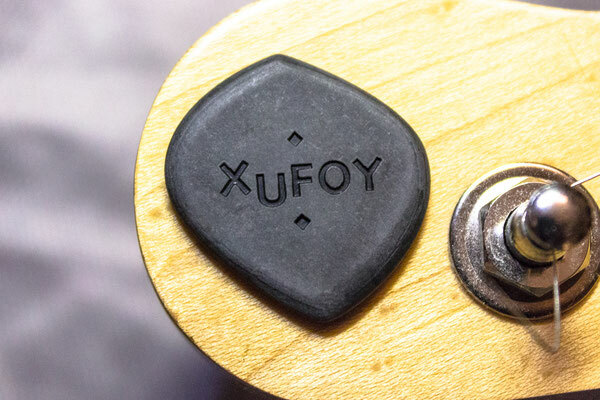 So, you must decide if the "GO" or the other XUFOY Plectrums are "good" plectrums, but dont be stupid, dont believe the people who are saying "You dont need a good pick, its all about Technique!". Guitarist who are using heavy, unflexible pick mostly want to play singlenotes, that are sounding direct and clear (and loud if the want), but they want to play fast to. So that are two different aspects, and of course it is a challenge to design a Pick that unite booth aspects. Many Guitarist just take tradional shaped Plectrums and buy the thickest ones, 2mm or 3mm. Now they can play loud and clear single notes, ok. But when they want to play fast, the problems beginn: In my opinion these Plectrums are not designed to play fast. The guitarists now make strange techniques or moovements to adjust. But it does not really work. Just a few problems: When you turn a traditional shaped Pick, to play fast, the sound does disappear sometimes, the more rounde the tip is, or you get stucked at the strings because the angle of the tip is not wide enough. Or a main problem: Many guitarists (even many "Pros") hold the Plectrum loose, because they want some sort of flexibility. I will be honest: In my opinion that is one of the stupiest think you can do. Why buying a unflexible Pick, because you want clear and bright (and loud?) sound and then hold it loose to get "flexibility"? And these guitarists are saying thing like "Oh, my Plectrum falls away easily, i need more grip!" or "oh, my Plectrums turns in my Fingers, i need more Grip!" The result of this development you can see when you look at the products og many big Companies, which are selling millions of Picks to (amateur) guitarists. There you can find a lot of more or less traitional shaped Plectrums, from hard materials, and aggressive grip structure. So, of course a Plectrum should be "grippy", and the GO has a good grip because of the structure too, but: When you hold it loose, every plectrum can fall away. The GO is designed to hold it tight, but you are nevertheless able to play fast and with feeling, because of the shape! Or in other words: When you feel that you have to hold a plectrum loose to play that what you want to play, then you have not the correct Plectrum or even a bad Plectrum. New thing are unusual when you try it first, even if they are better. So, of course, when you try something new, when you try to solve problems, you have to be open to something new. A few years ago, i met a gypsy jazz guitarist who told me: "Oh, i like your products and ideas so far, but you need a Pick for Gypsy Jazz in your sortiment!, it must be hard like Ivory for a good sound, it must not turn in the fingers or fall away…" and so on. He wanted good and not a bad Plectrum for Gypsy Jazz. So, i looked how Gypsy Jazz guitarists play and what kind of Plectrums they use. Most of them used Plectrums that i woud described as "Traditional shaped from hard material and with Grip". But some other, their Plectrums did looked like a rotten, smooth Potato Chip. Mostly handmade. It was hard to see where the "tip" ist, because it looked like… like a potato chip. I thought about this, i asked me why do these people use these ugly looking pieces of plastic, they can buy better looking Plectrums from the big companies? In my opinion the answer was: The tip of these "plastic chips" where so wide angled, that you almost did not recignize that there was a tip. These sort of "wide angled tip" enabled the player to play faster and with more feeling by just turning the pick a littlebit. and the sound does not disapear complete like when you are you using the round side of the pick. So, i looked at this, and tried to bring the new ideas into a new design. The result was the "GO" shape. Unsymetric, to enables you to hold it in the "right way" in your fingers (see pictures) and with 4 tips. The wide angled for fast playing (above the "GO", the more traditional like (under the "GO") and the rounder (left and right) for these who want mostly play rhythm. The hole design is a combination of "sharpness" and roundness, so that you always have the ability to switch easily from a "sharp" tip to a rounder part. And because of the shape, you can hold it tight, and play fast. My friend, the gypsy guitarist, did not liked it. I ask him why? I gave him a paper and a pencil, so that he can show me what i must do different. The result was: A drawing of a pick that was more symetric, longer, rounder at the tip, more narrow angled tipp and a photo of a famous jazz guitarist on the Plectrum. I said to him, that its not possible to make a photo like this on a plectrum. And i said to him, that (expect of the photo of the jazz guitarist) he can buy such plectrums. I showed him Websites of some big (or small) companies where he can buy such Picks. 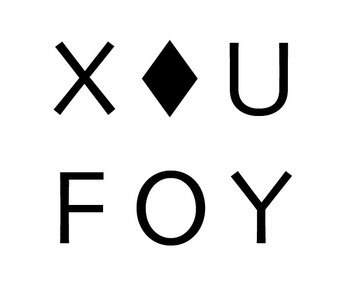 And i saw at the PIcks he using and said: Generally you have such Picks, you described. So why should i design something, that allredy exist? I think the problem was: He wanted to solve some Problems, but did not want to change anything. But in my opinion, it was totaly nessessary to change things, especially the overall Shape of the Plectrum. 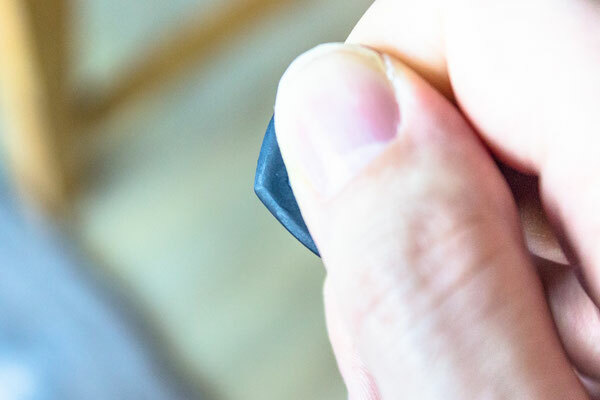 To solve the "Plectrum falls away and turn into fingers because i hold it loose" Problem, it does not make sense just but the next aggressive grip structrure on it. The solution (in my opinion) was to mae a design that you can hold tight, and enables you nevertheless to play fast. when you doing the same things again and again, without changing something, you cannot expect different results. 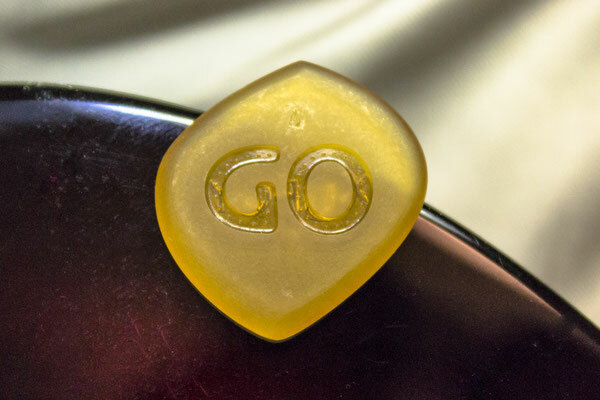 Why does the "GO" Plectrum looks a littlebut like a ugly potato chip? It would be very easy to produce just the next traditional shaped guitar pick. But that was not the aim. The aim was to create something that is better. And go get better, you have to do something different. Conclusion: When you are using unflexible Plectrums like this, and want to play fast and/or virtuous, the shape of the Plectrum is very important. 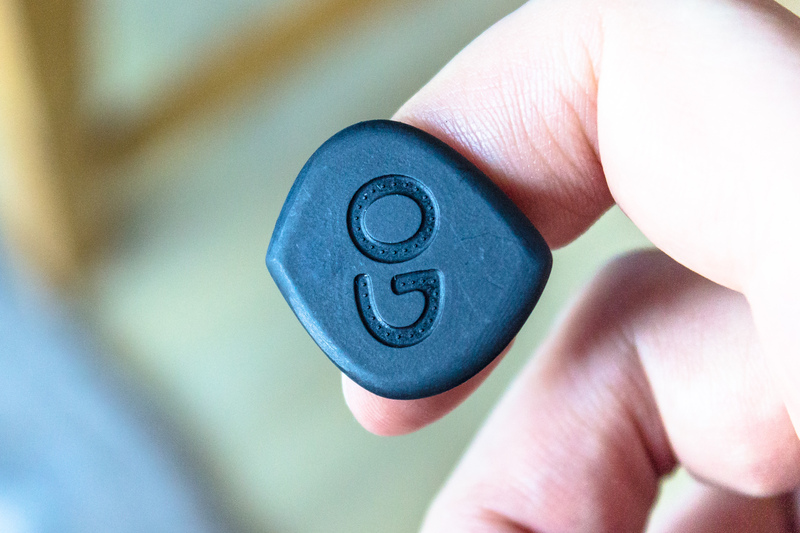 The "GO" Plectrum has a "functional" Shape. Thats the reason why it looks different as many Plectrums, which just look as they do, because its "traditional".